Knitting in circle: Is it possible to connect 100 knitters?? My name is Kerstin Lindstrom and I work as an artist. 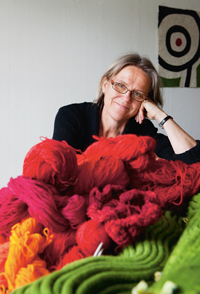 In summer 2010 I taught students at the Nordic knitting symposium in various textile techniques. The symposium was held in Härnösand, Sweden. I was fascinated by the activity that went on. Colourful women sat in groups during breaks or at lectures and knitted incessantly. It was like a low-intensity power plant that just went on and on. The work generated human warmth. This autumn an idea was occupying my mind. Would it be possible to connect 100 knitters in a monumental, common knitting? Alle vi, som deltog i strikningen, fik en uforglemmelig oplevelse. Vi ville gerne være fortsat meget længere, end vi gjorde, for at fastholde den store følelse af fællesskab og samhørighed på tværs af nationaliteter, mens vi var forbundet af det fælles strikketøj. Nu nyder vi at se billederne, som dokumenterer, at vi var der, og vi gjorde det sammen!